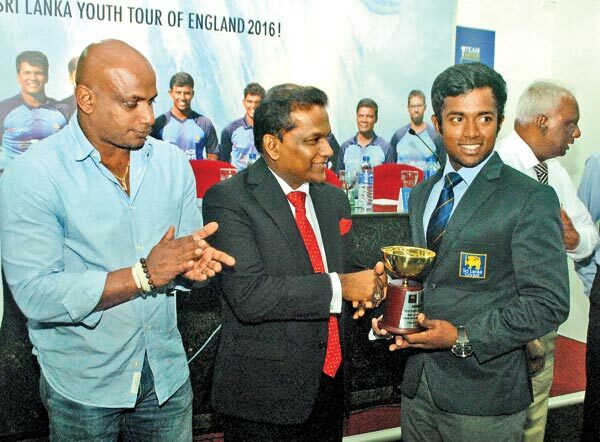 Sri Lanka Under-19 cricketers are knocking on the door of the national side, Sri Lanka’s chairman of selectors and former Test captain Sanath Jayasuriya said at a press briefing held at Sri Lanka Cricket headquarters soon after the victorious Sri Lanka Under 19 team arrived from England following a successful tour. Sri Lanka Under 19 cricketers beat their English counterparts to win the two-Test Youth series 1-0 and followed it up by whitewashing them in the three-match Youth ODI series 3-0. “I am very happy to say that a few players in the Under-19 squad are knocking the doors on the national side,” said Jayasuriya, who has been keeping a close eye on the development of junior cricket even during his previous tenure as the national selector. Jayasuriya said under SLC president Thilanga Sumathipala's management, SLC has put a great effort in developing junior cricket with the junior selectors headed by Ranjith Madurasinghe, who has done an excellent job. The Sri Lanka Under-19 team, led by Charith Asalanka, was warmly welcomed at the SLC headquarters following their historic tour of England. The Sri Lanka under 19 cricketers on their arrival from a successful tour of England attend a media briefing at SLC headquarters yesterday. Pictures by Ranjith Asanka. “Our fielding was exceptional and it came for high praise from England umpire Nick Cook,” said Halangoda. “He said we are a brilliant fielding unit, better than either Sri Lanka A or the current national team.” Cook, is a former England cricketer turned first-class umpire. “I have no words to say, I am really happy that our players have done a great job,” said SLC president Thilanga Sumathipala under whose leadership Sri Lanka cricket has reaped tremendous success during the year. “We are proud as a country as this happened while the national side whitewashed the No. 1 Test team, Australia,” the SLC president said. “Under the guidance of Nelson Mendis, Mahinda Halalgoda and coach Roy Dias, our players have maintained good discipline in the UK, it's an admirable moment,” said Sumathipala. SLC presented one million rupees to the victorious Under 19 cricketers. The cheque was officially handed over to the Sri Lanka under 19 captain Charith Asalanka by president Sumathipala. Special mention of should be made about the newly appointed coach of the junior, ROY DIAS. I really feel that he made a big difference in the team. He is one of the best coaches in the job today, first he did it for Nepal juniors for a while. I'm proud that our boys (juniors) won a series in England, in their own backyard and came home victorious winning both formats. Following the Seniors now. Good news, Good for SL cricket for the future. Well done ROY and other staff, keep up your good work. Now a shot at the next Youth WC. Over to you boys of proud Lanka.